Prime Minister Tuilaepa Sa’ilele Malielegaoi’s now infamous interview about the internal battles among members of the government’s legal fraternity is more than just a good laugh. But when we’ve stopped giggling, it must be said it’s a direct admission about the disunity that exists within the government, which they have found impossible to contain so that the legal system today has become the laughing stock of the world. 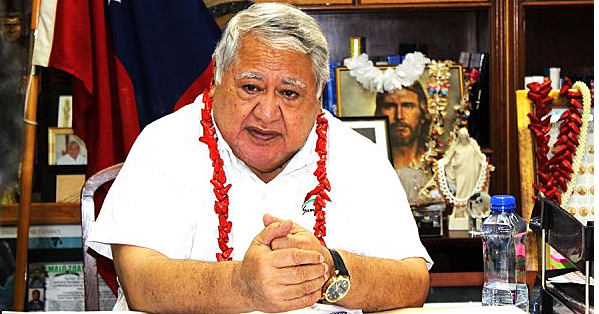 Prime Minister Tuilaepa’s interview last week was not an accident. It was not a slip of the tongue either. His comments – as light as they might have seemed – reflected a far more serious problem within his administration. It is the fight for power, the battle to show who is more superior. It’s nothing new though. It started among members of the H.R.P.P (with differences still simmering from what we’ve been told) and now it has filtered down to public servants whose egos are just like their masters. Interestingly enough, with the Prime Minister admitting that “my children” are suffering a bit of fever as they struggle with “teething problems” in their fight test their skills on each other, the picture is as clear as daylight. There are divisions among the ranks and it is extremely worrying. Which brings us to the point that nothing good comes from division. Let us be reminded today, division and disunity breed destruction. And yet that’s precisely what we are seeing unfold before our very eyes with this government. Who wants to be in Prime Minister Tuilaepa’s shoes? It could perhaps explain why he chose to make light of the issue when his opinion was sought last week. The worry is that not only are these divisions becoming glaringly obvious, the results are ugly too, judging from what’s been happening in this country lately. While the law enforcement officers are being caught up in their ego tangle, crime figures continue to alarm. Just last week, a young girl reportedly took a 24ft white fiberglass boat from Apia Harbour in what can only be described as a James Bond-type mission. Although the Police are investigating, a few days later, a girl’s body was found floating on the water by some fishermen at Utuali’i. The boat was also found abandoned. Is there a connection between the boat and the dead girl? What might have happened to the girl? And could something have been done earlier to save her life? This is just one of the questions that demands the full attention of our law enforcement bodies. These are cases worth investigating with the idea everything must be done to protect Samoa’s borders. And yet our law enforcement officials – who are Tuilaepa’s so called children – are too occupied playing their ego games. To be brutally frank, everything points to a government that is slowly but surely losing the plot. Whereas some politicians are behaving like an uncontrolled bunch of kids, the public service can’t help but follow suit. We can’t really blame them. They are merely emulating the behavior of their masters. If their masters are behaving erratically, what makes you think the people they rule over would not? The simple truth is that regimes come and go, regardless of how powerful they become. History exists to tell us this. And during the past few years, we’ve witnessed enough powerful regimes being toppled near and far. In many cases, some of the world’s most powerful men who were behind these regimes ended up deeply embarrassed. That’s if they survived of course. It’s undeniable that the political system in Samoa today is dominated by a party mostly concerned about its predominance. Their philosophy – like most political parties – is about winning power and keeping it. The sad truth is that this system is responsible for unemployment; hardship and rising poverty since it promises wealth and money for loyal followers while the rest are left to fend for themselves. This has been the case in Samoa for a while now. And while politicians and people in power enjoy the sweetness of their evil ways, you can’t say the same about those poor people who are finding it increasingly difficult to get by. Look at all the street vendors hawking goods in Samoa day and night. But they are not the only ones. Lately, there has been a trend of thieves and robbers going after the properties of people they perceive as the rich in this country. That must be a real concern. Hardly a day goes by in Samoa when there is not some sort of incident that makes you shake your head in unbelief about what has become of our paradise. We’ve said this before and we will say it again, we need to be warned not to allow complacency to turn this country into a joke where it looks beautiful from afar when it’s actually becoming rotten at its core. As for the government and the public service, let’s remind them here and now that division breeds destruction. If this sort of carrying on is allowed to continue, it’s hard to be encouraged about the future. What do you think?